UPDATE: The McKibbin Loft vacate notices mentioned below have now caused The Deli 10th Anniversary party to move to Brooklyn Fireproof. Details TBA. The Deli Mag has been chronicling the local scene (in NYC and other cities) and talking recording gear for 10 years, and they’re celebrating a decade in print with a few parties. with Higher Animals, EULA, Melody Joy, Deathrow Tull, The Pluto Moons, Paxico Records, Joya Bravo, and Rue Brown, with a special Brooklyn Wildlife set featuring Ohene Cornelius, Johnny Voltik, Tyquan Sounds, Stonehenge Parnhashnakovsky and more. Also playing, legendary junglist DJ Soul Slinger, plus a BBQ, tattoo artists and more. The party starts at 4 PM and the flyer is below. As mentioned above, this was originally supposed to be at McKibbin Lofts but is now happening at Brooklyn Fireproof. Stay tuned for details. 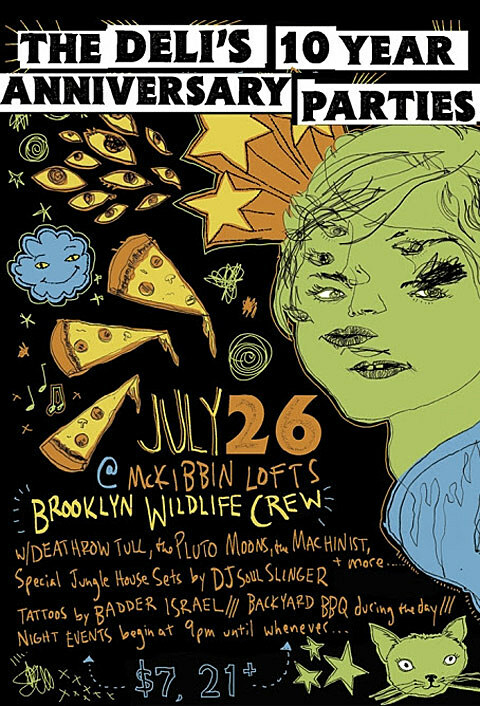 Then next weekend The Deli will take over Brooklyn Night Bazaar. The Friday, August 1 show is with Drowners, Spires, Mainland, The Can’t Tells, and Little Racer. The Saturday, August 2 show is with Diane Birch, Secret Someones, 5J Barrow, The Prettiots and Poor Remy. Those shows, like most at BK Bazaar, are free and open to the public. You can also RSVP to skip the line. And in related news, Gothamist reports that a few of the tenants living in McKibbin Lofts basement spaces have been ordered to vacate with a notice saying “the Department of Buildings has determined that conditions in this premises are immediately perilous to life.” Lit Lounge is due to open its Bushwick location in McKibbin this fall.